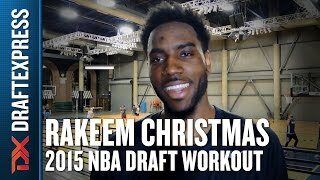 An interview with Rakeem Christmas featuring footage from his pre-draft workouts with Joe Abunassar in Las Vegas at Impact Basketball. The 6' 9 big man was one of the best players between both groups on Thursday, showcasing a much more polished offensive game than we saw at Syracuse. Known mostly for his rim protection, offensive rebounding and ability to finish (thanks to his 7' 5.25 wingspan) with the Orange, Christmas scored in a variety of ways on Thursday. The Virgin Islands native knocked down a handful of mid-range jumpers, including a step back going to his right. Christmas also ran the floor in transition, dropped in a right handed jump hook and showed off his mobility by diving hard out of pick and roll sets. Christmas did a lot of damage facing up from mid-post areas as well. The 23-year-old big man shot nine free throws, in large part due to his ability to jab right, put it on the floor going left, and sweep his arms through the defender to draw the foul  he even dropped in an And 1 floater on one occasion. Christmas scored in a variety of ways on Thursday and did a couple of things scouts and executives questioned about his game during his four years in college. Christmas certainly helped himself on day one of the NBA Combine. A Mcdonald's All-American three and a half years ago, Rakeem Christmas' career at Syracuse hasn't really evolved the way some may have hoped. Despite being one of the oldest players in his high school class (he turns 23 in December), Christmas barely played as a freshman and then followed that up with two relatively non-descript seasons, averaging around 10 points per-40 with average rebounding numbers to boot. While Christmas hasn't developed into a prolific scorer (his 10.8 points per-40 was lower than any college player drafted last season, and his overall usage rate is miniscule), he's managed to at least become a more efficient offensive player, upping his 2P% from 53 to 61% as a junior and his free throw percentage from 57 to 73%. Still, he's largely a non-factor offensively, with a 12% usage rate that would rank dead last among any player drafted in the past 13 years, showing just how rarely he touched the ball for Syracuse in his 24 minutes per game this past season. Not a very skilled big man, Christmas sees most of his offense by crashing the glass, diving to the rim on cuts and pick and rolls, and mixing in the occasional post-up for good measure. He lacks the lower body strength or footwork to be overly effective with his back to the basket, as he doesn't possess great touch and is relatively passive looking to assert himself, but can be very dangerous when catching the ball in the immediate vicinity of the rim. He ranked as one of the best finishers in college basketball last season, converting an outstanding 73% of his attempts around the basket, thanks to his tremendous length and very good leaping ability, allowing him to elevate and convert plays from impressive distances. Unfortunately Christmas saw less than two opportunities per game in these situations, despite playing next to one of the best passers in the country in Tyler Ennis (and Michael Carter-Williams the year before). Outside of catching and finishing, there isn't much to speak of regarding Christmas' contributions offensively. He doesn't show enough intensity running the floor to be much of a factor in transition for Syracuse (scoring 4 points all season according to Synergy), he rarely draws fouls, and he hasn't shown much range on his jump-shot beyond 10-12 feet. Defensively, Christmas has nice tools with his terrific 7-4 wingspan which allows him to play bigger than his 6-9 height, and very good athleticism to boot. He sits at the back of Syracuse's trademark 2-3 zone and rarely strays very far outside of the paint, being tasked with protecting the basket, which he does very well. Christmas blocks shots at a high rate, as his 3.6 blocks per-40 would rank sixth best among returning Top-100 prospects if he was deemed as such. He uses his length very effectively to contest shots around the paint and sometimes on the perimeter when forced to make a closeout, as he's very mobile and quick off his feet. Christmas' lack of size and lower body strength works against him at times, as opposing teams often looked to post him up as a way of attacking Syracuse's zone. He struggles to hold his ground at times and will give up deep post-position in turn, something that would likely be more of an issue against higher level competition operating as an undersized center like he has throughout his career thus far. Christmas chases a lot of blocks, which puts him out of position on the glass, one of the reasons he averaged just 5 defensive rebounds per-40 minutes last season, a very poor rate. However, he also doesn't show great instincts for pursuing loose balls, often looking content just standing around flat-footed when rebounds come off the rim, as he doesn't appear to have the highest motor around. He's been a relatively poor rebounder his entire college career, which is not ideal considering how limited a player he is offensively already. After four years of sitting inside the paint and protecting the basket as part of Syracuse's zone, Christmas will be at somewhat of a disadvantage relative to his counterparts transitioning to professional basketball as he attempts to learn how to operate in man to man settings virtually from scratch. Can he guard power forwards on the perimeter? How would he fare in different pick and roll schemes? These are all total unknowns for NBA decision makers and coaching staffs, which won't help his cause. With that said, after starting over 100 games at Syracuse, Christmas will be one of the most experienced players in the ACC, and it will be interesting to see what kind of role he plays this season on a team that is in somewhat of a rebuilding phase. With no Tyler Ennis, C.J. Fair, or Jerami GrantSyracuse's top three scorers last year- someone will need to step up and play a much bigger role for the Orange offensively, and Coach Jim Boeheim has already gone on the record saying Christmas will be the most improved player in the conference. This is a big year for Christmas, as he has one last chance to show that he wasn't such a highly touted player in high school for nothing, and after losing quite a bit from last season, Syracuse will need all the help they can get from him. A McDonald's All-American and consensus top-25 recruit coming out of the Academy of the New Church in Pennsylvania, Rakeem Christmas played a fairly small role for the Orange as a freshman. Plugged into the middle of Jim Boeheim's zone for 11.5 minutes per-game, the 6'9 post struggled with foul trouble, but showed promise in a number of areas. With Fab Melo moving on to the NBA, Christmas will compete with junior Baye Moussa-Keita and incoming freshman DeJuan Coleman for minutes in the post for one of the nation's most talented teams. Standing 6'9 with a 7'3 wingspan, Christmas has good dimensions for a power forward, but functioned primarily as a center last season. A very good athlete with a frame that has terrific potential to carry more muscle, Christmas, at the very least, passes the look test. As he evolves as an offensive threat, he could emerge as a more viable prospect at the power forward position, which he'll likely need to in time. At this point, Christmas's offensive arsenal is mostly limited to catch and finish opportunities. Able to play above the rim effortlessly in space, the freshman shot 62% at the rim in his first year of college basketball. Benefitting from the versatility of Syracuse's deep, experienced back court, Christmas still needs to improve his touch around the rim to help him finish under defensive pressure and has plenty of room to expand his versatility and role for the Orange. Christmas also has ample room to improve his overall skill level. He was, for all intents and purposes, never asked to create his own shot or make plays away from the rim. He did not attempt a single jump shot last season according to Synergy Sports Technology and lacked the polish to score with any consistency in post-up situations on either block. If Christmas is to reach his full potential, he'll need to find a way to contribute in back to the basket situations and become a more competent player away from the rim. Christmas's best contributions came on the defensive end. Averaging a solid 10.3 rebounds and 2.9 blocked shots per-40 minutes pace adjusted, Christmas had some nice moments patrolling the paint last season, thanks to his terrific physical tools. Lacking discipline, seldom staying on the floor when encountering a pump-fake, and still clearly uncomfortable defending away from the rim, Christmas will have to become a more active, fundamentally sound defender to make the most of his abilities on this end of the floor. Perpetually in foul trouble, Christmas's ability to hold his own and be physical without fouling in the center of the Orange zone could be the biggest factor in his playing time this season. Still in the early stages of his development, Christmas is a raw but intriguing long-term prospect thanks to his tremendous length and athleticism. If he's able to show significant development in a few key areas as a sophomore, he could gain some traction among scouts this season, but ultimately may end up needed more seasoning. Michael Carter-Williams and Rakeem Christmas discuss their future legacy with the Syracuse Orange. A consensus top-5 recruit in the 2011 high school class, its easy to get enamored with Rakeem Christmas (#5 Scout, #4 Rivals, #7 ESPN) upside. He passes the look test and then some on first glance, showing decent size, a good frame, long arms and downright freakish athleticism. Christmas (no relation to ex-Temple swingman Dionte Christmas) jumps out of the gym, runs the floor like a deer, and is extremely quick off his feet. Offensively, Christmas is extremely limited at this point, which probably isnt a huge surprise considering the stage of development hes currently at. He gets most of his offense by running the court in transition, presenting himself at the rim for easy finishes, and crashing the offensive glass. On the block, he has very little in the ways of footwork or post-moves, and doesnt seem to be all that interested in scoring actually. Disinterested is a word that seems to come up a little more than youd hope when it comes to Christmas, as he doesnt always seem to be competing all that hard, looking fairly apathetic at times and not really putting his terrific tools to good use. Defensively, Christmas has huge potential, and he already can be very effective as both a shot-blocker and man to man defender when he puts his mind to it. His length and terrific leaping ability allows him to establish himself as a major presence rotating from the weak-side, and we saw him send back quite a few shots while watching him play, sometimes in emphatic fashion. His lack of strength makes it difficult for him to avoid being posted up by stronger big men, but his length and lateral quickness can be extremely bothersome, leaving a lot of room for optimism in this regard as his frame continues to fill out. He can already step out and hedge screens on the perimeter quite effectively, which is a nice asset to have from your big man. Christmas is someone that obviously jumps off the page immediately right now thanks to the undeniable potential he possesses, mostly thanks to his terrific physical attributes. Hes still got quite a ways to go obviously, though, especially in terms of the effort level he displays.